Richie Whitt's DFW Sportatorium: Johnny Goofball Denies He Took Money For Autographs. Yeah, Right. Johnny Goofball Denies He Took Money For Autographs. Yeah, Right. As most of us have known all along but you've been too stubborn to admit, the Johnny Goofball autograph story isn't merely an erroneous ESPN fabrication that you can simply mute via midnight yell practice. Now CBS is on the story. And now the NCAA is spending six hours questioning the reigning Heisman Trophy winner about whether he took money in exchange for signing autographs. NCAA: Johnny Goofball, er, Football, er, Manziel, did you get paid for signing all those autographs? NCAA: Okay, we're done here. Carry on. As Texas A&M struggles with the risk-reward of playing its quarterback Saturday against Rice in College Station, the vital question remains unanswered. According to CBS, Manziel denied to the NCAA that he accepted cash for his countless signatures. If not for payment, why would a 20-year-old rock star/athlete spend all that time autographing over 4,000 photos and helmets and cleats and jerseys, etc.? Just for fun? For some charity that he's yet to identity? Because he's such a good kid? C'mon. We're not the sharpest knife in the drawer, but we ain't idiots either. 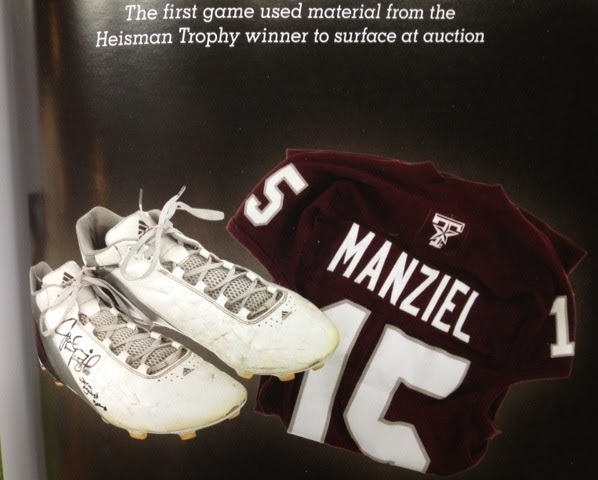 You know what I think about Manziel's thorny family tree and you're aware that irregularities in his signed memorabilia can be traced back to 2012 in Dallas. And until proven otherwise I'm sticking to my theory that Nathan Fitch is taking the fall. As Goofball's "manager", Uncle Nate will tell the NCAA that he lied, deceived and betrayed his friend about the autographs. That it was him who accepted the money. Sure the memorabilia brokers paid "Johnny," but Nate siphoned all the money. Nate told Johnny he was signing for, um, charity. Yeah that's it, charity. That way Nate broke no laws, A&M isn't culpable and Goofball comes off only as naive, even sympathetic. Goofball and A&M will publicly denounce Uncle Nate but, behind closed doors, the two friends split the loot and laugh all the way to the bank. It speaks loudly that, in the wake of the revelations, Fitch has lawyered up and declined numerous interview requests. If there's zero credibility to this story and if Manziel nor Fitch nor A&M did anything wrong or broke any rules, why the silence? Why is Fitch reluctant to talk? Why has A&M AD Eric Hyman issued a gag order on the subject? If I'm innocent of a charge, I talk about it openly, freely and immediately. If I'm guilty, I go quiet for a long time planning how the hell to spin the story and get out of trouble. Like all college football fans, I want to see Johnny Goofball on the football field, especially Sept. 14 when Alabama visits College Station. But I'd also like the question answered. By anyone. If Johnny Manziel didn't accept money, then what was his motivation for signing all those autographs? The NCAA doesn't want to suspend him either, they're making way too much money off of him. You can't compare this to Ohio State; A&M has been irrelevent too long. Now that they are relevant, well I mean, now that they have a player that's relevant and stands out, they have to squeeze every cent they can out of him. When he leaves, hello SEC cellar. Yes Aggies, it's that simple. You couldn't win the Big 12 when you had Johnson, McGee, or Tannehill; the last time anyone knew who your quarterback was, his name was Bucky. Enjoy one more season ags. The NCAA doesn't NEED Manziel for anything. they sure didn't mind selling his jersey until they were called out, did they? The NCAA NEEDS all these athletes, how else would they make money? Saying the NCAA doesn't need the reigning Heisman winner is short-sighted. ESPN will market the hell out of that every game. Let me turn it around and ask the question : If the NCAA has proof ofthe allegations why would the spend six hours questioning him? If they have so much proof why don't they release it? Like in the Ohio State mess? Yo Anomy.. Like Cam Newton, JF will skate because he won't talk and he is backed by a university, a head coach and alumni that wants to win so bad they would do anything to win. Remember this is the same university and fan base that added National Championships in the middle of the night. Good point, Richie. I wish you wouldn't have started calling him Johnny Goofball though. It isn't funny, cute, or clever. "... If I'm innocent of a charge, I talk about it openly..."
The current topic not withstanding, that is not a very smart approach to defending one's self against leveled charges. Ask any defense attorney worth his salt, and he will verify that. I need a new uniform, my one is worn out. If you know where I can get it, follow the link.